While the average viewer probably won’t remember the 1968 Golden Globe Race, let alone have heard of Donald Crowhurst; you’ll be hard pushed to find a sailor who hasn’t, and who doesn’t know the events that transpired. Therefore it was always going to be difficult to give a sailor a compelling film which also appealed to a wider audience. The film definitely benefits from the significant acting talent of Colin Firth (Crowhurst), Rachel Weisz (Mrs. Crowhurst) and David Thewlis (Crowhurst’s overzealous press agent – Rodney Hallworth). Firth steals the show as Crowhurst and while his physical resemblance is uncanny, he manages to give great insight into the torment of Donald’s mind – played out in a slow transformation from plucky enthusiast to terrified realist and manic defeatist. A significant amount of the film is given over to the build up to the race, so much so it felt that only a third actually involved the race and his subsequent mental decline. The recreation of his trimaran sailing yacht, Teignmouth Electron was excellent and gives a real feel of the chaos and cramped conditions Donald must have faced. The picture is filmed beautifully with soft filters and atmospheric lighting which transport you to the Atlantic and the past. 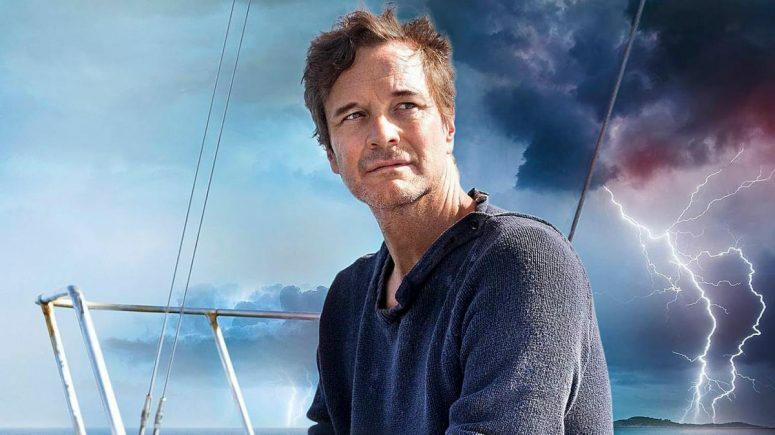 While reviewers have claimed this film did not break any boundaries after Robert Redford’s sailing survival film All Is Lost (2013), the real strength of this film is its subject; the tragic but fascinating true story of Donald Crowhurst. In contrast, Redford’s critically acclaimed film, while visually impressive and brilliantly acted, is woefully unrealistic from a sailor’s perspective and is a complete work of fiction. Legendary sailor Sir Robin Knox-Johnson, Golden Globe Winner (the sailing race, not movie award! ), was scathing of All Is Lost but commended The Mercy as fantastically gripping. Although the film is a accurate it did not devote much time depicting Crowhurst’s descent into madness, the viewer is slightly left wondering what had happened – was it guilt which drove him to suicide or was he psychotic? While the non-fiction nature of the subject matter is its strength, its slow chronology of small but essentially important events which led to Donald’s mental decline was never going to be easy to capture in 112 minutes. To conclude; a must see for any sailor or non-sailor but we definitely advise reading The Strange Last Voyage of Donald Crowhurst (1970), by Nicholas Tomalin and Ron Hall, in order to fully understand the whole story.